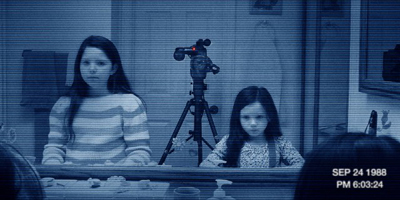 When it comes to jump scare horror franchises, Paranormal Activity beats them all hands down and now comes the prequel, set 18 years prior to the events of the first two films. 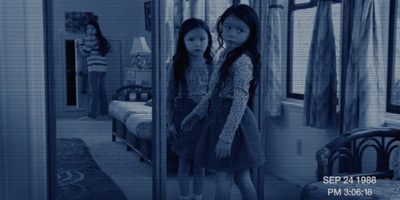 Sisters Katie and Kristi are tormented by an invisible entity, which resides in their home and begins to haunt them. There is a history within their family that dates way back to their grandmother, a woman who made a deal with 'something' in exchange for wealth. A great addition to the series while tying in the first 2 films. I feel the 3rd film was the most frightening of all, iv'e never jumped so much. You always sensed that there was something about to happen even if it didn't. It kept me on the edge of my seat from start to finish and would recommend it to anyone. Overall great film, great acting and lots of scares/ jumps. It's a great movie. The two little girls can act real good. The tension is build up throughout the movie, scene's of activity alternated with scenes of investigation. The movie makes it easier to understand now, how the activity started. The only negative comment is that they left rather important scenes in the trailer out of the movie. The Exorcist is left out of the movie and the scene where the house is on fire. Despite this , I still recommend to watch it, it really gives you the chills. After you watched it you'll think twice if you hear a weird sound.